Hours: M-F 7am-5pm, Sat 9am-3pm, Closed Sun. Times Visited: Countless! Habitually, like any caffeine-addicted Portlander with a soul, I find myself walking past big name coffee shops for a great cup of coffee at my spot of choice. When I’m at work, my pick is the downtown location of Coffee Plant. It’s the most realistic, vegan-friendly coffee shop I can get to on what I deem a coffee break. Don’t get your hopes up, they don’t have vegan paninis or anything more lunch appropriate you can find at, well, a coffee shop without vegan sandwiches. If you want one with sandwiches downtown, head to Half and Half or Backspace. What they do offer is reliably well-made Stumptown Coffee and espresso beverages and vegan baked goods. 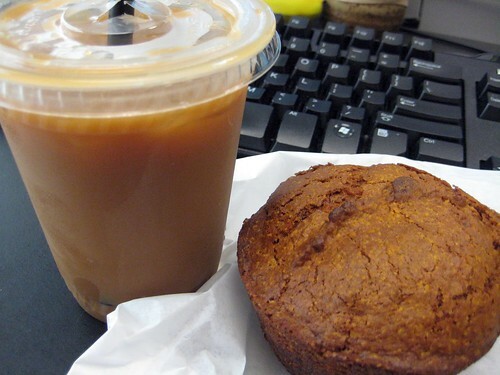 Unlike most other coffee shops in Portland, where you can grab a plastic wrapped vegan delight that may hit the spot, or just may be mushy or stale, Coffee Plant offers vegan pumpkin muffins and cinnamon rolls ($2.50 each) that are baked daily. They are specifically labeled vegan, and it’s certainly not just the vegans asking for them. You can smell the pumpkiny spices drifting through the door on weekday mornings. I normally consider myself a fan of bakery style muffins, with a slightly crunchy crust sprinkled with coarse sugar, but whenever I give into the moist pumpkin muffin for breakfast temptation, I am delighted. There’s no crunch, but there’s one fluffy, filling, spiced bite of dark pumpkin goodness after another. I’ve been sporadically giving in since 2005, and they’ve always been this satisfying. The cinnamon rolls are gorgeous. 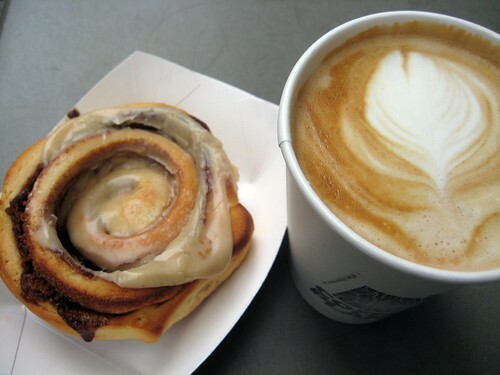 The frosting is generous and infused with cinnamon, something I wish more rolls would hit up. Admitting another of my pasty preferences: I’m a soft, Cinnabon type gal, and I’ve had very few vegan cinnamon rolls that accomplish this emulation. This cinnamon bun has all the sweet flavor, but it’s sturdier than what my dreams are about. The tempting discounted day-olds on the counter are even sturdier, understandably, and are quick to go. For that matter, the cinnamon rolls themselves are usually gone by late morning. Please don’t think I’m insulting their cinnamon buns, they’re probably dreaming about being dipped in a cup of coffee, and I think they’d be dynamite there. Besides the muffins and cinnamon rolls, Coffee Plant usually has a tiny selection of vegan Voodoo Doughnuts available, of the cake variety. The shop itself is small, and from the rotating art on display to the comfortable baristas, to the scent of pumpkin, it’s a bit of downtown hustle mixed with the attraction of neighborhood shops elsewhere around town. Like any other coffee establishment, there’s continuously a line in the morning, but the staff is well trained and you can sense the customer service through the little bits of obligatory cool attitude. There are two small tables outside the shop, inside window nook seats, tall tables with bar stools and a table or two inside the actual downtown building the shop resides in. While it’s a place I have caught up with a friend over coffee during the afternoon, I take my order to go 99% of the time. I can’t envision myself sitting down with a book in its small environment with the to and fro through their doors, but that’s me, and my focus is on heading back to work. Despite running out the door, the act of sipping one of their pretty, rosette adorned lattes alone relaxes me. Of course, they offer espresso, americanos, cappucinos, and bottled sodas, on top of house and French pressed coffee. 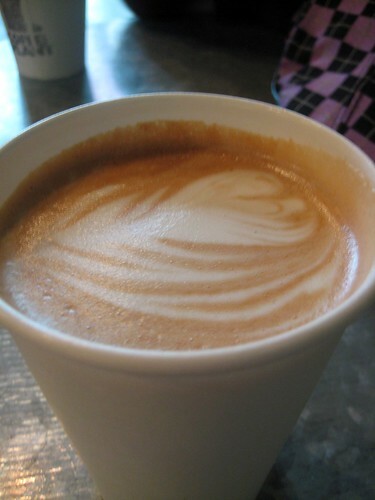 The Stumptown Vegans don’t regularly review coffee shops, but Coffee Plant is one this reviewer frequents and it stands out with its commanding of foamed soy and two freshly baked vegan items. Again, none of their paninis are vegan, and I can’t help but have a tragic, faint recollection of salads in the cold case from their former neighbor, the vegetarian Divine Cafe cart, which moved in 2007. Rice and soymilk are both additional charges, as it goes, and you do have to ask for these nondairy milks for coffee (at no charge). I’ve never had so much of a raised eyebrow at that casual request. It’s definitely no magical Sweetpea Baking Co., but it’s my workday fix for splendid soy lattes. And as you now know, I’m really enjoying my love affair with the pumpkin muffins. Coffee Plant opened a second location in the Corbett Building in the SW Johns Landing neighborhood in 2006, which also offers hemp milk. Both locations have cute green and orange punch cards promising a free drink one day. Where’s your favorite vegan friendly coffee shop in Portland? We’ll be writing about the very, very best soon, hint hint! Cellar Door is my favorite. They just plain roast and brew amazing coffee and serve it well! They do carry vegan pastries and bagel, with vegan toppings available. Oh yes – adore their coffee! Do they have house made vegan treats now? I know I’ve seen items from Dovetail before. That’s a tough question, homies. On the one hand, I looove the baked goods from Black Sheep, but they serve Peet’s coffee, not Stumptown. Given a choice on overall offerings, I’d have to say Sweetpea Baking Co., where they have an incredible array of awesome vegan baked goods (that rival only those that come from my kitchen) and Stumptown coffees. They rock! And is this the same place as the Coffee Plant on SW Corbett? I work up the road and occasionally (only occasionally, as that hill is the dickens on a fixie) drop down for some Stumptown and a pumpkin bar or something. Best Muffin I Have Ever Had. I’m going to Portland in a month – can’t wait to go here!